The brand new HYDAC Diesel PreCare BC 240 is designed for compact engines, specifically with diesel fuel. Being a small, dual functioning filtration system it has high-performance stability, easy to use and provides options for either manual or electrical venting. Best of all, this product is built to last with the guaranteed HYDAC quality! The new prefilter HDP BC 240 expands the HYDAC product portfolio in the field of Diesel fuel filtration on compact engines. While formerly a flow volume from 340 up to 2400l/h has been covered, this new product complements the range in the lower area to 240 l/h. Even this compact size does not make any compromises concerning water separation. The separation takes place in two technically separated steps: coalescence and separation stage – the same process like in bigger filter sizes. Requirements of modern fuel injection systems on filtration and separation can perfectly be matched by this technical trick. High-performance stability, due to an efficient water separation on the clean side over the entire service life. Element change = complete overhaul since the water separation stage integrated into the element is also replaced. Extraordinary service friendliness through simple and fast element change. Environmentally friendly through a fully incinerable element. Flexible in use due to inlet / outlet option. 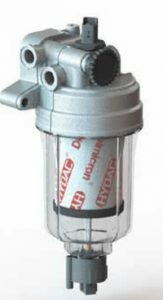 Guaranteed HYDAC quality since the filter can only be operated with the use of an original HYDAC element.